Attention to all the KL fans! We are coming back to ENDAH PARADE, Sri Petaling for our first sale in 2017! 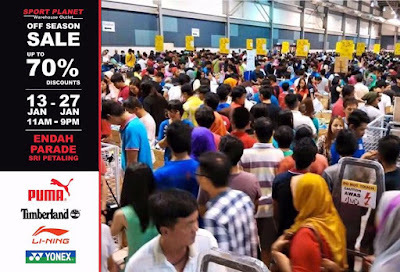 This year we are bringing more discounts UP TO 70% on million products from international Sports Brands such as Puma, Nike, Timberland, Yonex, Adidas etc in 25,000ft of space area. We have a variety of products from apparels, shoes, bags, socks and more. So, Mark you calendar and join our 2017 first sale! PAY LESS GET MORE! !